To keep the reconciliation process running efficiently, records need to be purged periodically. The Purge Bankrec routine is provided for this purpose. Purge applications will archive files to a repository and those files will not be available to the system. 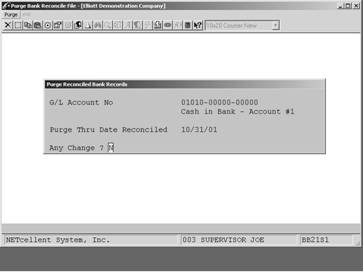 Select Purge application from the process window. Enter the cash account and reconciled cutoff date to purge accumulated data. The routine will purge all reconciled transactions in the Bank Reconcile File through the cutoff date. It will also purge the corresponding records in the A/P and P/R check Reconciliation Files. This will keep processing time down to a minimum. Purging the Bankrec File will print the Purge Journal.